At sufficiently high pressure, hydrogen is believed to become a monatomic metal with exotic electronic properties. Because of the very high pressures required to create such states, hydrogen-rich compounds have been considered alternative materials that could exhibit many of the properties of atomic metallic hydrogen, such as very high-temperature superconductivity, but at accessible pressures. With the help of theoretical predictions, a research team using the HPCAT facility has successfully synthesized superhydrides with La atoms in an fcc lattice at 170 GPa upon heating to about 1000 K. The results match the predicted cubic metallic phase of LaH10 having cages of thirty-two hydrogen atoms surrounding each La atom. Upon decompression, the fcc-based structure undergoes a rhombohedral distortion of the La sublattice. The superhydride phases consist of an atomic hydrogen sublattice with H−H distances of about 1.1 Å, which are close to predictions for solid atomic metallic hydrogen at these pressures. 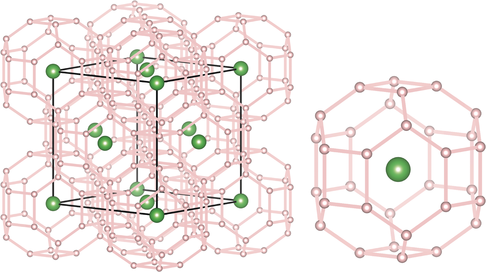 With stability below 200 GPa, the superhydride is thus the closest analogue to solid atomic metallic hydrogen yet to be synthesized and characterized. More in Z.M. Geballe, et al, “Synthesis and Stability of Lanthanum Superhydrides”, Angew. Chem., 688, 2018.